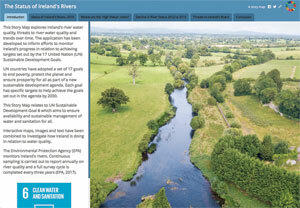 The national statistics offices and mapping agencies participating in the pilot program are creating information products, including story maps like this one, to engage with constituents. The United Nations (UN) has undertaken an ambitious challenge to help countries achieve an extensive collection of social and economic development goals by 2030. 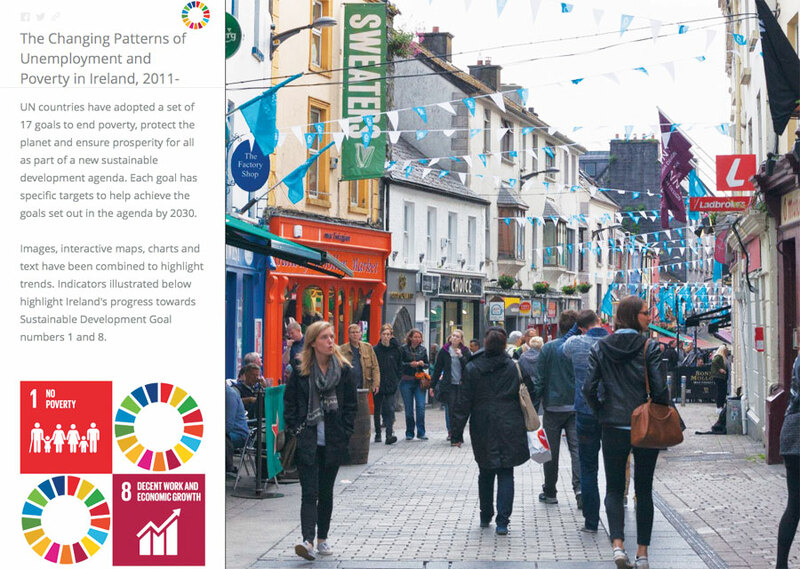 Known as the Sustainable Development Goals (SDGs), these 17 lofty objectives range from eradicating poverty, ending hunger, and ensuring gender equality to building infrastructure and creating inclusive, sustainable cities while protecting land and conserving water. What really sets these goals apart from the UN-backed Millennium Development Goals—which drew to a close in 2015, making way for the SDGs—is that, for the first time, the United Nations Statistical Commission coordinated a globally agreed-upon framework for each country to measure its progress in an open, timely, and actionable manner. The purpose is to encourage member states to make data-driven decisions so they can foster positive change at a faster pace. The UN recognizes the role that location plays in integrating information about society, the economy, and the environment, as well as to simply track each of the SDGs. The organization has been working for years to combine geospatial and statistical information to visualize patterns, address data gaps, and effectively target resources to areas demonstrating the most need in order to improve overall development outcomes. (See “National Statisticians Embracing Location-Based Information” in the Spring 2015 issue of ArcNews.) 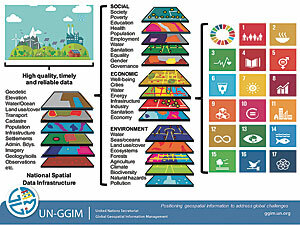 Now, the UN Statistics Division (UNSD) is teaming up with Esri on a research exercise to test a data hub that will help targeted member states measure, monitor, and report their progress on achieving the SDGs within a geographic context. That is exactly what the new web mapping and data management platform—called the Federated Information System for the SDGs, or SDG Hub—will do. 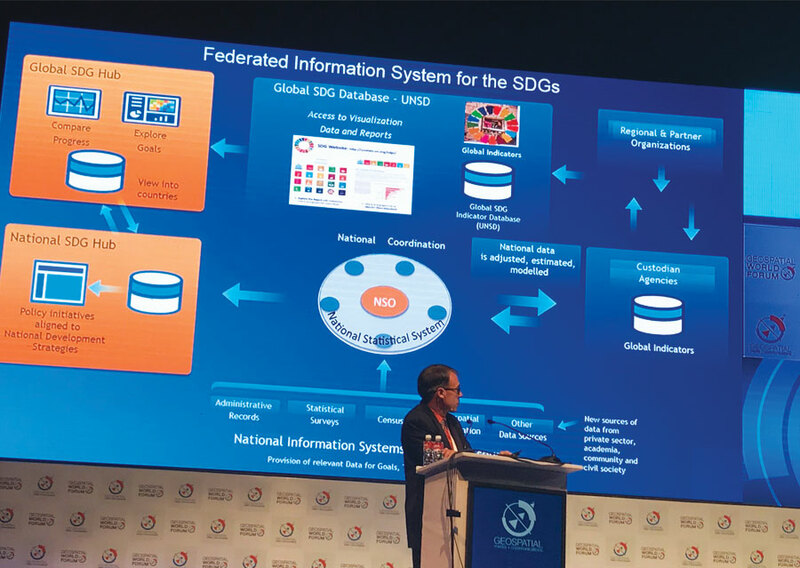 Stefan Schweinfest, director of UNSD, discussed the Federated Information System for the SDGs, also known as the SDG Hub, at the Geospatial World Forum. The SDGs are based on the 2030 Agenda for Sustainable Development, which addresses the significant development obstacles that come with trying to wipe out poverty, tackle injustice, and deal with planet-wide environmental damage. The ambitious and transformative agenda encourages member states to measure and monitor progress using good policy, science, technology, and data. In particular, the 2030 Agenda demands that member states undertake new data acquisition and integration approaches and focus on high-quality, timely, reliable, and disaggregated data. It also calls out geospatial information and earth observations as key methods for tracking progress and informing people about this global policy mandate. 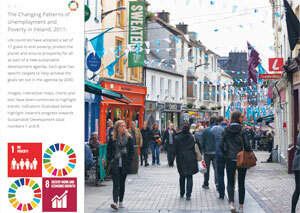 Each SDG is composed of specific, action-oriented targets. The 2030 Agenda identifies and defines a total of 169 targets. The targets, in turn, have their own indicators that demonstrate progression. Currently, these global indicators are tallied at 232. Individual countries then set their own national and regional indicators that reflect their unique challenges and priorities. Countries also develop their own initiatives to frame their actions and track the efficacy of their approaches. Organizing data and tools around initiatives makes it easier for national statistics offices (NSOs) to align SDG-related data—such as the proportion of the population living in consistent poverty—with relevant goals when publishing data resources. Thus, NSOs can provide context for their open data, giving anyone who uses these resources the knowledge and awareness they need to apply them in ways that address real problems. For example, a government agency or nonprofit organization can further explore a problem like poverty by looking at a country’s unemployment rate and occupational skills to determine if there is untapped capacity in one region to match available jobs in another. 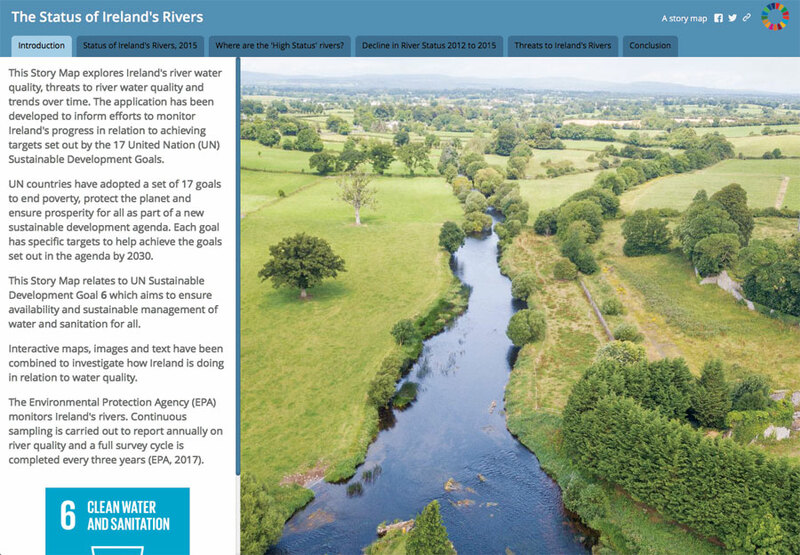 Likewise, an agency or organization can explore data about the overall health of local waterways alongside the location of industrial areas or other known water polluters to pinpoint sources of water contamination. Location plays a huge role in integrating information about society, the economy, and the environment, and it is key to tracking progress in attaining each of the SDGs. What makes data exploration like this feasible is having all the information in one place, which is what Esri and UNSD are doing in their joint research exercise. For the project, several member states are leveraging their existing data systems and deploying an ArcGIS Hub in conjunction with ArcGIS Enterprise to help their NSOs integrate SDG-related data into their own work. The exercise also seeks to have NSOs align their data and systems with other in-country SDG stakeholders, including national mapping agencies, health ministries, natural resource and environmental agencies, and private-sector statistical data producers. The flexible deployment options of ArcGIS Hub and ArcGIS Enterprise—with ready-to-use apps, maps, and data—expedite how quickly NSOs can contextualize their data with location. Using location information as the overarching framework, NSOs can visualize and analyze data at the national and global levels in a consistent manner—even when there are differences in format, scale, or metadata among datasets. Integrate data from different systems using the common denominator of location. Share data-driven maps, apps, templates, and analytical tools. Apply maps and spatial reasoning to explore data in intuitive ways so they can gain a deeper understanding of the complexities and dependencies inherent in the SDGs. Parse problems at different scales to test and discover which actions have the greatest impact. ArcGIS Hub and ArcGIS Enterprise facilitate the free flow of disaggregated data, integrate data in a consistent manner, provide spatial context for the data to promote understanding and engagement, protect sensitive data through security and privacy controls, and deliver information products and tools that help people apply the data to policy priorities. Most importantly, ArcGIS links data together at the global, national, and subnational levels and has the capacity to unite efforts among multiple countries. Additionally, by enabling interaction and collaboration among multiple self-contained Web GIS deployments, ArcGIS Hub and ArcGIS Enterprise scale Web GIS to achieve a system of systems, where data is offered as a service rather than a finished product. 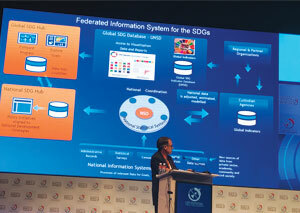 The United Nations Statistics Division (UNSD) is working with a pilot group, which includes Ireland, to define the requirements for a Federated Information System for the SDGs. Starting in May 2017, UNSD launched this research exercise with a pilot group of NSOs and mapping agencies from Brazil, Colombia, Ireland, Kenya, Mexico, Morocco, Palestine, the Philippines, South Africa, Senegal, Tanzania, and the United Kingdom. They helped define the requirements for the SDG Hub. Now, each of these offices is applying a services-oriented architecture, known as a system of systems approach, to data sharing. It allows users to engage with data as a service, changing the traditional approach to statistical data production and dissemination. In the past, NSOs tended to aggregate data and records, putting them through a series of transformations and validations before making them available to end users. The SDG Hub removes this time-consuming step of aggregating data, allowing NSOs to instead connect to data from each data producer. This makes the data itself the primary source of information (rather than an aggregation of it) and speeds up its integration using the common denominator of location. The NSOs and mapping agencies participating in the pilot program are deploying their individual SDG Hubs in three phases. In the first phase, the focus is to align national priorities with the SDGs and identify specific steps to take to achieve the goals. In the second phase, the emphasis is on capacity building, wherein each office takes full advantage of enterprise GIS and leverages the data sharing and spatial analysis capabilities of the SDG Hub. In the third phase, the pilot group expands on the outcomes of previous phases and concentrates on designing and creating information products—including story maps and other apps—to encourage constituent engagement and communicate progress in achieving the SDGs. Several members of the pilot group already have their SDG Hubs up and running and are currently working on building capabilities and tools to engage stakeholders from the public and private sectors, both domestically and internationally.